As my body tend to react violently and protestingly to being cut open, I really hoped to aquire as few of these as possible. The surgery to remove my thyroid gland along with the offending cancer went relatively well. No major blood loss this time and it only took them a few hours post op to get my pain under control which is better than my other surgeries. My body never wants to wake after sedation. 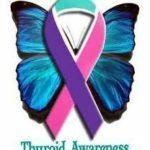 They removed my thyroid along with two cancer masses. One measured 3 cm another 2 cm. The cancer was only on the left side and later tests showed it had not metastasized to my lymph glands. 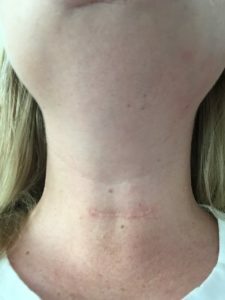 My incision was a bit tricky and unusual as my thyroid glad was located higher than in typical anatomy and was longer and slimmer, similar to a hot dog bun, compared to the typical shape of a butterfly. 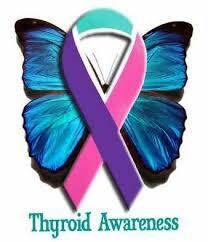 My scar is higher up so medical people infer I have had a tracheotomy rather than a thyroidectomy. They removed my parathyroid glands, diced them into tiny bits, cut open my forearm muscle with a scalpel, shoved the bits inside and sutured it up. It sounds very Frankenstein like but no joke, the cells regenerate, replant, and much of the time do their job now residing in your arm instead of your neck. Freaky! The parathyroid glands regulate the calcium levels in your blood. If they stop working or get damaged you have to take calcium 4 times a day every day for the rest of your life. 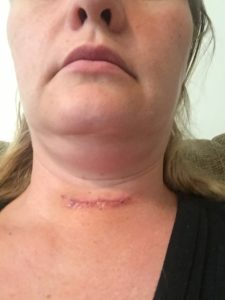 They remove them from the neck because there is a high likely hood of scar tissue build up in the neck area compromising function as well as preventing further damage to the parathyroid if you have to have further surgery in the area. I did have damage to my vocal cords. The nerves that control higher pitch and loudness were cut during the procedure. 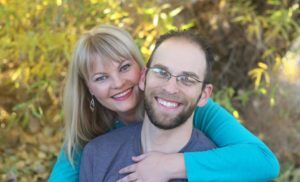 I lost much of my higher soprano vocal range while singing and had a difficult time yelling at my kids. When I would attempt to yell a kink of quack would come out similar to when a dog has been debarked. The kids thought it was hilarious. I was pretty sad. I have had some nerve regrowth. I year out I can now yell but my singing voice will never be the same. There is a fair amount of scar tissue and some small muscle paralysis, especially on my left side. 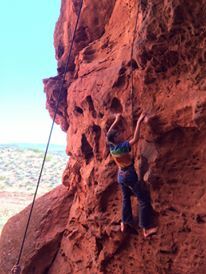 It means I still have a bit of a mass and limited range of motion in my neck. You can really only notice to range of motion issues when I do something like yoga. I had my typical “I had general anesthesia and my brain doesn’t remember how to function” brain fog for about 6 months after this surgery. This is actually a really difficult to live with and not commonly discussed side effect of surgery for many people. They just feel off for months afterwards and they often don’t associate their complaints with general anesthesia. This side effect alone is enough for me to ever put any thought of elective cosmetic surgery very very far out of my mind. So as far as side effects go I avoided the most objectionable, death, but managed to still ring in with four complications. Most people have none. Waaaa, whining over, I’m alive and that is great. They used surgical glue to hold the incision together. 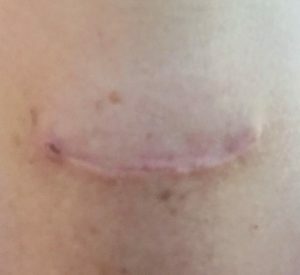 I feel like the scar was larger than it might have been if suture had been used because it actually caused gaping on the ends that didn’t start to heal until the surgical glue was removed. 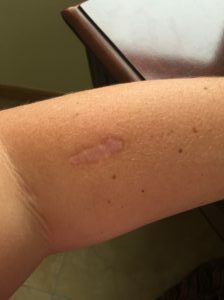 Major keloid scaring where they implanted my parathyroid glands in the muscle of my forearm. This scar actually bothers me more than the one on my neck. It still pulls and is painful. I was in the hospital for about 24 hours and very eager to go home. When I came home I was well taken care of by friends and family. 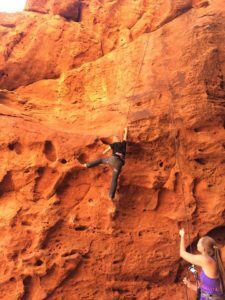 A friend even took our kids rock climbing to keep them out of my hair while I recovered. Pretty great neighbors. Wow where we lived was stunning. Truthfully my recovery was hard. I was so tired and just beat up feeling. I know many people bounce right back and are back to work on Monday after a thyroidectomy. Yes this is true, I pretty much wanted to punch every person in the face who said “Oh my neighbor/sister/friend had that and they were fine. 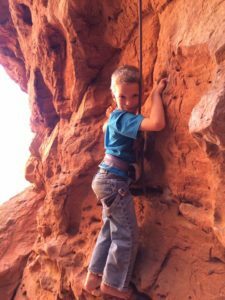 It was no big deal.” It was a big deal for my body. Have I mentioned it does not like being cut into. It protests violently as I have learned from my previous tonsillectomy and hysterectomy. So, recovery was difficult and I took my time. Doing a little bit every day but mostly spending as much time as I could in nature. 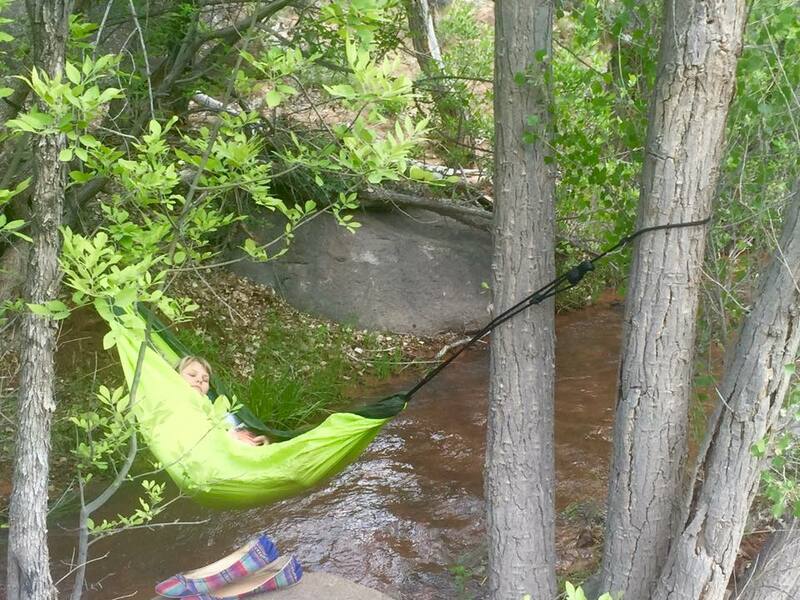 I stretched my hammock across our little creek, watched the kids play, and slept and read. For weeks. I knew nothing would help me heal faster.